ECOMI, a blockchain company committed to creating the world’s best platform to pay, protect, and collect cryptocurrencies and licensed collectables, announces the launch of their public token crowdsale. The crowdsale will help fund further production of ECOMI’s proprietary line of consumer digital commodity solutions for secure storage, easy payments, and crypto-collectables (or non-fungible token). 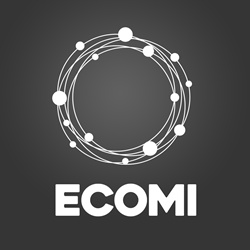 ECOMI’s crowdsale will offer 362,500,000 of their OMI tokens available to the public of the 500 million overall digital tokens. Each token will sell at USD $0.05 with an overall anticipated sale of $22.125 million to further the development of user-friendly security and storage solutions. ECOMI is spearheaded by CEO and co-founder David Yu, a serial entrepreneur with more than two decades of experience in the gaming and licensing business. The company aims to provide the world with user-friendly essential elements to securely store and interact with cryptocurrencies, sensitive data and information, and digital collectables. ECOMI tackles one of the most challenging aspects of owning cryptocurrency by helping users protect their hard-earned investments using the ECOMI Secure Wallet. The ECOMI Secure Wallet is a wireless credit-card sized hardware wallet that helps users protect their crypto-assets and is already available, retailing at USD $189. Transactions made using the Secure Wallet require physical confirmation directly on the Secure Wallet card. It boasts CC EAL 5+ government-level security ensuring the card remains hack-proof. In addition, the Secure Wallet never directly connects to the internet, making it safe from malware and cyber criminals. Later this year, the brand will launch ECOMI Collect. Verifying ownership of a digital collectable has previously been difficult, however ECOMI tackles this issue using blockchain technology. ECOMI Collect allows users to easily and securely purchase, trade, and sell licensed digital collectables from their favorite brands, such as tokidoki. Through ECOMI Collect, digital assets can exist safely in the app, and even more so on the Secure Wallet, with recorded ownership and maximum protection. Owners can also manage, share, and bring their digital collectables to life using augmented reality. The company is in the process of finalizing contracts with many well-known brands and licenses across art, gaming, animation, and film to offer users a wide variety of unique digital collectables. ECOMI also plans to launch other consumer solutions in the coming year including ECOMI One, a debit card-like payment method that aims to provide users with a way to pay for everyday expenses in many currencies, including cryptocurrencies. The ECOMI One card can store traditional fiat currencies (USD, AUD, etc.) as well as widely accepted cryptocurrencies (BTC, ETH, etc.). And because ECOMI One is NFC-enabled, it can hold all your credit, debit, and loyalty cards. Best of all, the ECOMI One card can be used anywhere major debit cards are accepted. The ECOMI Vault seeks to keep user data safe by encrypting the data and storing it on a decentralized platform. It functions similarly to a secure digital data storage platform but allows for added security using physical verification for sensitive documents and information. The ECOMI Vault is particularly useful for intellectual property, as the blockchain technology verifies the exact instant a file was created. Ecomi is on the ethereum blockchain and the OMI is an ERC20 token. Those purchasing more than 10,000 tokens (USD $500), will receive a complimentary ECOMI Secure Wallet. The crowdsale will close on September 30th, or when the hard cap is achieved. For more information, please visit and follow ECOMI for real-time updates via its website (ecomi.com), Telegram (t.me/ecomi), Twitter (twitter.com/ecomi_), Facebook (facebook.com/ecomi.ecosystem/), Bitcoin Talk (bit.ly/2J1Xogp), LinkedIn (linkedin.com/company/ecomi-technology/), and Medium (medium.com/ecomi). ECOMI’s vision is to create the world’s best platform to pay, protect, and collect using blockchain technology. ECOMI delivers the freedom to secure and control your digital collectables, data, and cryptocurrencies via a user-friendly solution. The ECOMI all-in-one ecosystem includes ECOMI Collect, ECOMI Vault, ECOMI Secure Wallet, and ECOMI One card and mobile apps. For more information, please visit http://www.ecomi.com.